We are confident that we construct quality bike leathers. 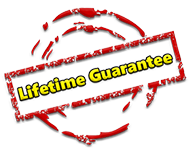 So much so that we offer a LIFETIME GUARANTEE on all stitching to the original purchaser of one of our leather motorcycle jackets or leather bike trousers. Looked after correctly, our leather gear can last you 20 years! A pretty good investment we’d say! “I have owned one of these jackets (Warrior) for over 25 years and it’s been used and abused all the way. It is still intact and held together in the way it was designed to be” – Andy, Australia. “Had my Warrior jacket for about 6 years, it’s done a fair mileage. Extremely comfortable and feels reassuringly protective” – Simon, North Yorkshire. “Bought one of these (Warrior) about 15 years ago. Been 100,000 miles in it and never had any problems” – Tim, Poland. “My last suit from Bikers Paradise must be getting on for 10 years old and nothing has ever failed so I have complete faith in the quality of their products” – Ian, Nottingham. “I have purchased from Bikers Paradise over the last 15 years. Great leathers, great service” – Buster, Isle of Wight. “I bought a black one (Aviator) years ago and it instantly became my favourite jacket. I wear it on the bike all the time. I am gonna buy a brown one very soon” – Kevin, Shrewsbury. “Being in the leather trade myself for 30 years, the weight and quality of the leather hide was perfect. I would recommend this company to anyone. The quality is second to none” – Josie, Wirral. As you can see, we have a reputation for leathers that last. But we like to make sure our customers feel looked after, long after the sale. Meaning that if you do have any problems with the stitching of your BP leathers, just bring them in (or send them) and we’ll rectify it as soon as possible (while you wait, if we can), free of charge for as long as you own the leather jacket or leather jeans. The lifetime guarantee applies to the construction of the garment. The standard warranty for everything other than construction (i.e. zips, press studs etc) is one year. This does not affect your statutory rights.